"The first two digits refer to the serotype (A*24), the third and fourth digits define substitution(s) in the coding sequence (A*2402), the fifth and sixth digits describe synonymous substitution(s), and the seventh and eight digits refer to substitution(s) in intron or 5' or 3' sequences. N and L mark alleles with no or low surface expression, respectively. end. A combination of two primers designed for each of the two polymorphic sequence motifs in cis allows the identification of an allele or a group of alleles that are characterized by these two motifs. 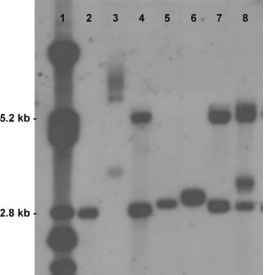 The presence or absence of the two motifs in cis is usually detected by gel electrophoresis,1-11-1 but other detection methods have been developed. The method is rapid and ideally suited for a small number of samples. The method can be applied for low-resolution typing, using primer combinations that detect all alleles within a given serotype, as well as for high-resolution typing. Depending on the HLA pheno-type, a combination of 300-400 different primer mixes is necessary to determine the HLA-A/B/C/DRB1/DRB3/ DRB4/DRB5/DQB1 alleles in a given individual.